The countdown is on to RDA IGAD’s pre-meeting "FAIR principles to all elements of the Research Process in Agricultural & related Sciences"
While attendees from all over the world are gearing up for the 11th RDA plenary meeting : "From Data to Knowledge" (21-23 March 2018, Berlin), preparations are also underway for IGAD’s pre-meeting “The FAIR principles to all elements of the research process in agricultural sciences and related disciplines”, set to take place 19-20 March, before the plenary. Since its inception in 2013, the Interest Group on Agricultural Data (IGAD) has grown in community strength to over 170 members, and is now one of the Research Data Alliance’s most prominent Thematic Groups. IGAD is a domain-oriented group working on all issues related to global agriculture data. It represents stakeholders involved in managing data for agricultural research and innovation, this includes those producing, aggregating and consuming data. IGAD also promotes good practices in research with regards to data sharing policies; data management plans; and data interoperability. In addition, IGAD is a forum for sharing experiences and providing visibility to research and work in agricultural data. One of the IGAD’s main roles is to serve as a vehicle that leads to the creation of domain-specific Working Groups. The second day of the pre-meeting will be dedicated to the working groups already associated to IGAD: Agrisemantics Working Group, On-Farm Data Sharing Working Group, Metrics and Indicators in Agricultural Sciences BoF, Capacity Development Working Group, Wheat Data Interoperability Working Group. 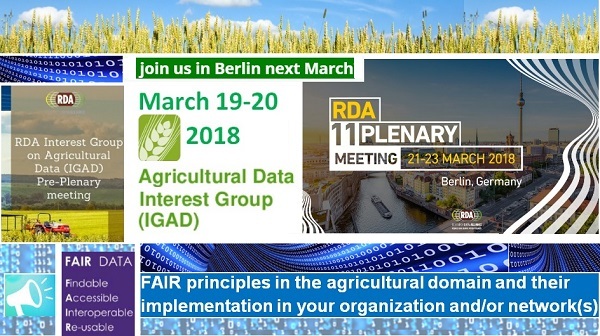 The Interest Group in Agricultural Data (IGAD) Pre-Meeting P11 will take place at Leibniz-Gemeinschaft in Chausseestraße 111, Berlin (Germany), from March 19 to 20, 2018. March 19 will be dedicated to the theme “the FAIR principles to all elements of the research process in agricultural sciences and related disciplines”. March 20 will be dedicated to the working groups. Detailed information can be found in the AGENDA. Target Audience : Professionals involved in managing data for agricultural research and innovation.